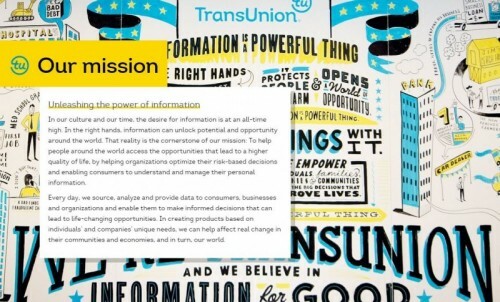 Earlier this year, TransUnion unveiled its new brand platform, Information for GoodSM. As part of its commitment to Information for GoodSM, TransUnion announced today the launch of its 2015 corporate social responsibility report, a comprehensive overview of its mission and commitment to its associates, causes, environment and customers. The report reflects TransUnion’s transition from a credit bureau to a global information solution and risk provider for consumers and businesses. The company has more than 4,000 employees, 38 offices, 1 billion consumer files, 30 petabytes of information, 90,000 sources of data, and an average annual data growth rate of 25%. TransUnion serves 65,000 business customers and more than 35 million consumers. To review the full report and learn more about TransUnion’s mission, causes and people, visit the corporate social responsibility site.